At Good Beginnings we believe authentic caring relationships among children, adults, Educators and communities, contribute to the healthy growth and development of children. We believe in a holistic approach when recruiting new members of our Educator, Cook and Administrative teams. Good Beginnings is a licensed child care organization that is regulated by the Ministry of Education. Individuals who are hired to work for our organization must possess the following: current Standard First Aid Including Infant and Toddler CPR, a satisfactory Criminal Reference Check-including Vulnerable Sector (less than 6 months) and a completed Health and Immunization Form. Educators, as researchers, co-plan with children by involving them in the decision making process to have shared input over the direction of their learning. As co-learners, Educators actively engage in learning with children while supporting them to explore their world with their body, mind and senses. As Educators ask children questions, they learn how to further enhance children’s interests and curiosities by expanding and scaffolding their ideas and creative learning. Good Beginnings’ Educators are Registered Early Childhood Educators, graduates of the Recreation and Leisure Program, Child & Youth Workers and Educational Support Workers. Good Beginnings also provides career opportunities to students of the above noted programs. Our Cooks are committed to providing the healthiest and most delicious foods to the children in our care. All Good Beginnings’ Cooks have their Safe Food Handling Certification. Our menus and food premises are reviewed by the Oxford County Board of Health. At Good Beginnings, our Cooks provide the recipe to children’s success! The Administrative Team works diligently to meet the needs of our families, community partners and the Board of Directors of Good Beginnings. The Administrative Team assists with the daily operations in areas such as finance, human resources and business administration. Good Beginnings believes in investing in our employees through professional development opportunities and by hosting workshops that are often open to our Community Partners. At Good Beginnings we ensure that we are always in compliance with the Accessibility for Ontarians with Disabilities Act. We have policies in place to ensure that all accommodations are met for individuals with disabilities, including during the hiring process. If you want to be a part of this dynamic team, please have a look at our current postings below. Please forward your application and resume to the contact information noted in the individual posting. Good Beginnings is hiring Summer Camp Educators. Please view the attachment for full job details. The successful candidates will provide child care for children (3.8 to 12 years of age) in a group setting under the direction of Good Beginnings. They will follow the vision, mission, philosophy, Program Statement, confidentiality, and the policies established by the Board of Directors, and regulations under the Child Care and Early Years Act. They will also be required to work as part of a team, to guide children in all areas of development. The successful candidates will provide support for children 3.8 years to 12 years of age, in a group setting under the direction of Good Beginnings Day Nursery and Chıldınü Oxford . Do you have your Diploma, or are you currently studying in Early Childhood Education, Child & Youth Worker, Recreation and Leisure, Educational Support or Bachelor's Degree in Child Studies of Education? If so, we want you to apply! Good Beginnings is growing and we are seeking friendly, energetic and engaged individuals to join our dynamic team! Apply today! Calling all cooks! Do you want to make a difference in a child’s life by ensuring that they have a healthy and nutritious meal each day? If so, we have the perfect position for you! 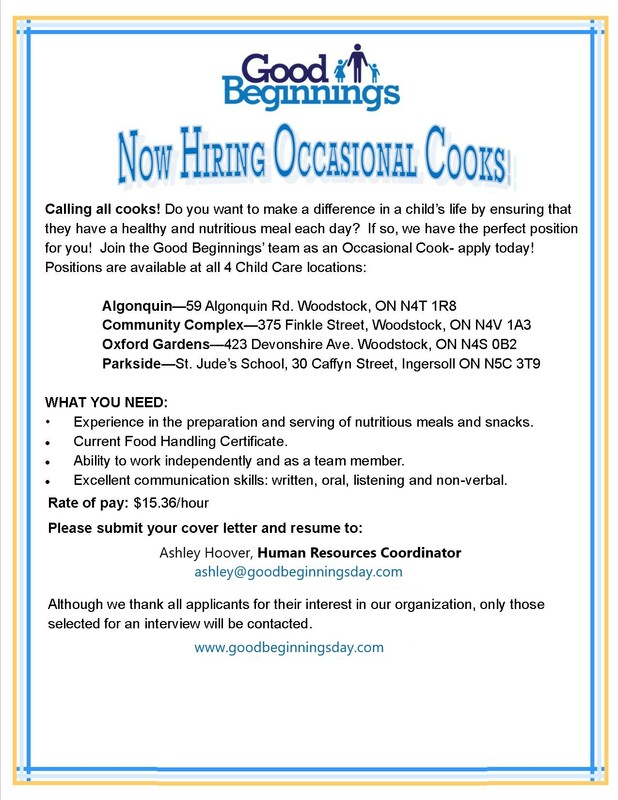 Join the Good Beginnings’ team as an Occasional Cook- apply today!